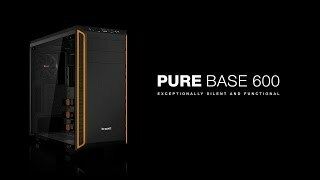 PURE BASE 600 | WINDOW ORANGE silent essential PC cases from be quiet! Pure Base 600 Window offers a great deal of functionality and features for an attractive price. The high-quality and fully-windowed side panel offers a perfect view of components inside your chassis. The window is made of 4mm tinted and tempered glass, and is decoupled from the case with rubber elements to inhibit the transfer of vibrations.